The business world today is moving at increasing pace along with increasing levels of volatility, uncertainty, complexity and ambiguity (VUCA) which demands new strategies, concepts and innovation transformation in leadership and workforce capabilities to match the level of change happening in competitive, consumer, customer, and workforce environments. We look forward to joining other thought-leaders and practitioners at the 2016 Human Capital Institute Summit in New Orleans March 29-30 to envision the future by creating the Agile Talent Ecosystem. Agility Consulting & Training (ACT), based in Greensboro, NC since 2001, is one of the major underwriters for the 2016 Human Capital Institute Summit of thought-leaders and practitioners assembling in New Orleans, LA on March 29-30. The business world today is moving at increasing pace along with increasing levels of volatility, uncertainty, complexity and ambiguity (VUCA) which demands new strategies, concepts and innovation transformation in leadership and workforce capabilities to match the level of change happening in competitive, consumer, customer, and workforce environments. The HCI SUMMIT annually brings together leading edge organizations and thought-leaders for a couple of days of high octane learning, sharing and provocative discussion. This year’s Summit is focused on Agile Talent Strategies for Managing Change and Shifting Priorities and includes keynotes from the Chief Human Resource Officers from diverse companies such as Aflac, Turner Companies and Quest Diagnostics. 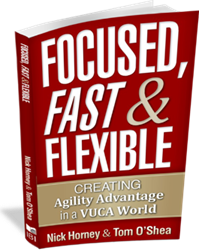 VUCA is a term originally coined by the US Army War College as a shorthand way of referring to the ongoing chaos happening around the world and the implications for our military leaders to understand and lead in this context this environment: Volatile, Uncertain, Complex, and Ambiguous. Back in 2005, Agility Consulting initiated a global collaborative called The Strategic Agility Institute (SAI) in an effort to encourage innovation and sharing around the agility construct. In June 2015, the SAI launched a major global pulse survey called THE VUCA REPORT to help identify, track, understand and compile innovation for next practices related to these conditions. We encourage and invite broad-based participation in THE VUCA REPORT – all participants will receive free summary report of the findings. O’Shea recently shared – “we know the future will continue to be filled with new forces of change accelerating the speed of play even further … and at the same time accelerating the risk of obsolescence. We see a growing trend called “accelerated obsolescence” impacting both business models and many leaders”. The future can be daunting, says Dr. Horney, “especially if you are not building your capabilities for anticipating change, generating confidence, initiating action better and faster, liberating thinking to discover new solutions and have effective frameworks for evaluating results”. Agility Consulting & Training is recognized globally as a leading resource for insight and tools to help leaders, teams and organizations build agility as a competitive advantage. ACT has been fully dedicated to building a body of knowledge and analytics about agility since 2001. The firm announced development of four key practice areas and leaders in 2015. Each practice area reflects the application and proprietary tools derived from THE AGILE MODEL® - globally recognized and research based framework for building leadership, team and organizational agility. 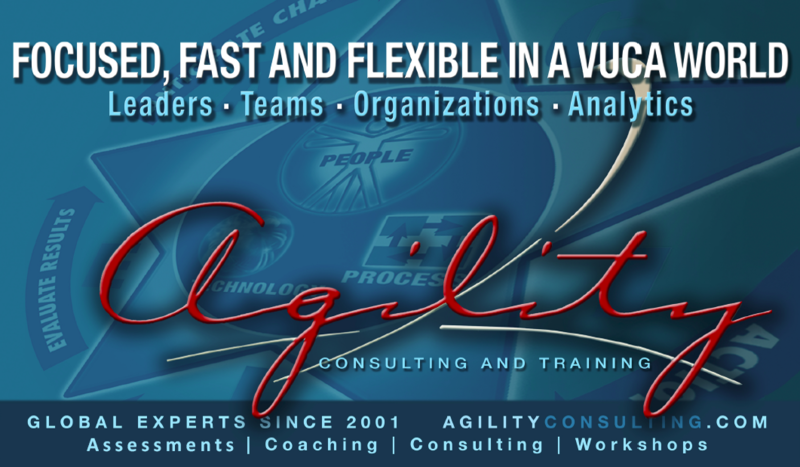 Agility Consulting & TrainingGlobal Experts building leadership, team and organizational agility since 2001. 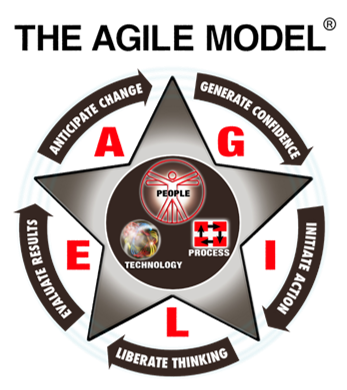 The Agile Model®The Agile Model® is widely recognized as the best-practice model for organizations and leaders looking to build greater agility to compete in a VUCA world - volatile, uncertain, complex and ambiguous.